Every Spring, since we’ve been here, we’ve had a Robin’s nest near the house. 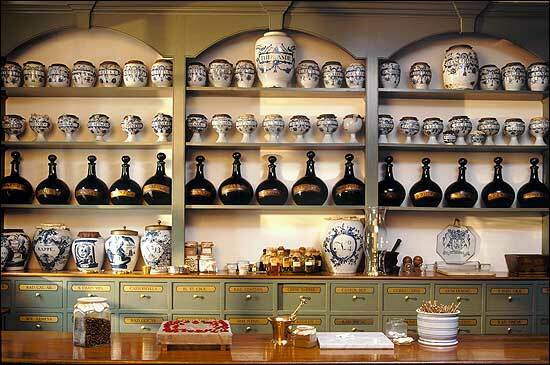 That’s why we call the place Robin Hill – plus it has a little bit of Robin Hood in it. Year One (2008) they chose the rafters of the carport and Year Two they chose the nook next to Year One’s nest.� We never understood why they do this, as the carport is a relatively busy place. Each time we would walk in or past, the Robin on duty would take off with a great flutter of wings to perch on a nearby tree branch from which to scold us until we left. I know that Robins will return ever year� but will never re-use a nest, and now it seems that they won’t even use the same space. In anticipation of their return I had moved the two old nests so they could go there again, as they seemed to like it so much. Instead they chose to move into the Japanese Andromeda that is right next to the mudroom entrance and the guest room window. An even busier place! We now use our other (main) door – which leads straight into the living room – as often as we can, and try to tiptoe around, but it is difficult not to disturb them. The frantic escape from the dense bush is even more alarming what with all the leaves flying off as well. Still, it makes for great observation. Maybe we will install that webcam. 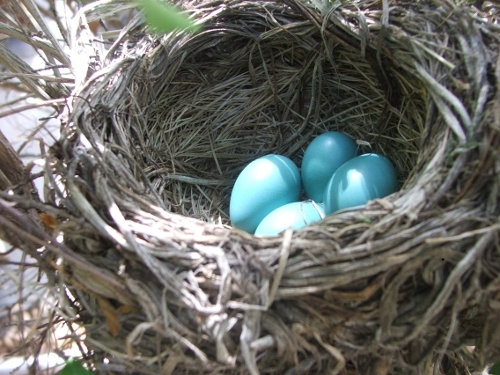 So far there are three beautiful blue eggs in the nest (Robins lay one egg a day and usually stop at four) — ah, that was based on my quick peek yesterday: today there are four! 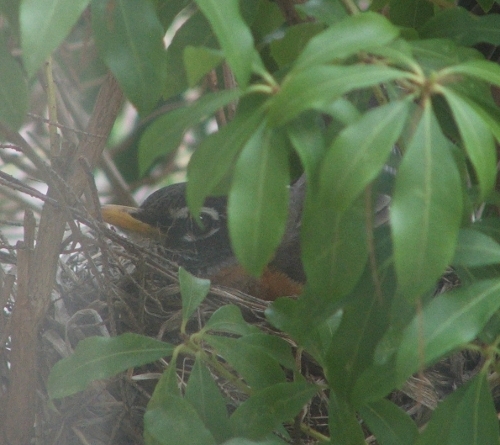 And one wary Momma Robin (it’s usually the females who incubate the eggs). There must be a bird’s nest in our shed as well. Each time we walk in there is a loud chirping, but we haven’t located it yet, so I can’t say what it is. Maybe the wrens, who always hang out in that shed. We too have robins that have made a nest right by our mudroom door (which we use constantly) I don’t think they have laid eggs yet but I’m a little concerned how they will react to us once they do, and when they hatch. People told me to take down the nest when they first started building it but I didn’t want to do that. We too may have to use our front door but that isn’t very convenient. I’m anxious to watch this whole process, but kind of wish they weren’t right near my door!